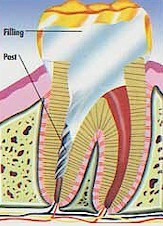 Root Canal Treatment or Endodontics is a procedure that involves the filling of the core of the tooth (pulp) with an inert material. 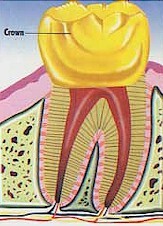 C=Deeply destroyed, carious tooth with gangrenous pulp and acute opical periodontitis, submucosal phase. 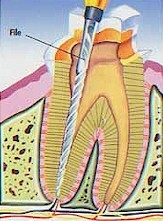 D=Deeply destroyed, carious tooth with gangrenous pulp and acute apical periodontitis, enostal phase. 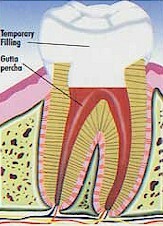 A filling, usually silver or a tooth-colored dental material, may be used to fill the opening in the top of your tooth. The chief benefit of root canal treatment is that a tooth that otherwise might require extraction, can actually be saved to contribute to a healthy and functional dentition for many years. If you have any of the above listed symptoms, it would be advisable to visit Dr.Sathya's™ Dental Care & Implant Centre, since we can tell you whether you have a root canal disease or not, as some of these symptoms can be due to other problems as well.